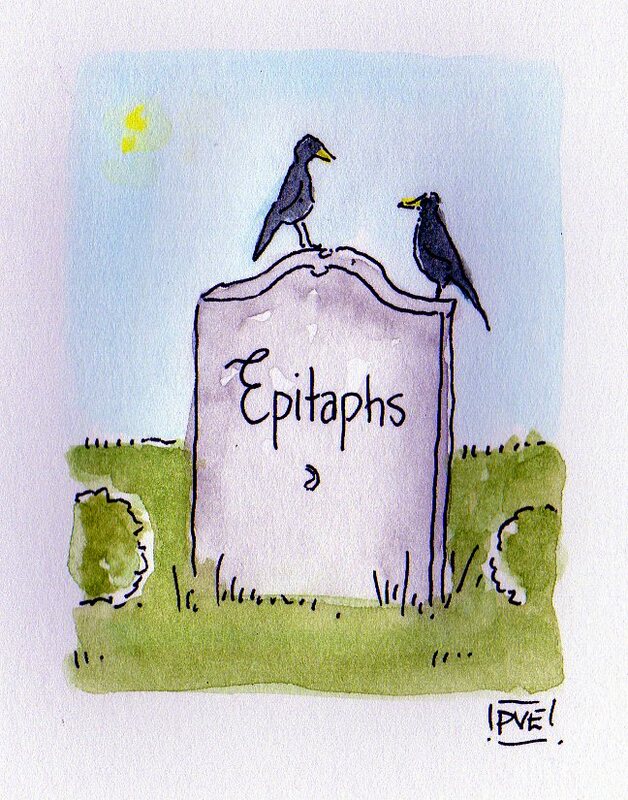 I’m sure you may be wondering what in the heck Epitaphs are doing on this blog. People are asking. This isn’t really my page. It is Dearest Beloved’s page. He has a non-traditional sense of humor. Coming up with witty epitaphs, palindromes, and other word plays is one of my husband’s many talents. “I thought, therefore I was.” – Dead Philosopher. “To be or not to be is no longer the question.” – Dead English Playwright. “I was wrong, God does play dice, although roulette is his favorite.” – Dead Physicist. “Why don’t you come down sometime n’ see me?” – Dead Buxom Blonde Movie Actress. “Ask not what your cemetery can do for you – ask what you can do for your cemetery.” * – Dead American President. “I thought I’d be board, but I’m knot.” – Dead Carpenter. “Feta Accomplis.” – Dead Cheesemaker. Find the next letter in the series listed below. As a clue, you should know that 80% of 6th graders solved this within 5 minutes whereas a group of NASA engineers took over a day! O T T F F S S E ? You don’t think DB has forgotten about these just because his wife had lapsed in posting them, do you? “Que Syrah, Syrah. “ – Dead Vintner. Dear PVE – that is cute, too!